In the past, I’ve mentioned my reasonings for choosing Squarespace and why I recommend this website builder to businesses of all shapes and sizes. Today I’d like to talk about a topic I frequently get asked about and that’s search engine optimization (SEO). More specifically, how you can make your Squarespace website SEO friendly right after it’s freshly designed and launched. Within each of my web design packages, I provide three optimization services for my clients: Squarespace on-page, Google, and Bing. After the design is finished and approved, I begin the optimization process by checking off a list of items geared to prepare the site for the web and search. Title tags show up in the tabs of your window browser and describe the content of that specific page. They're one of the most important on-page SEO elements that also appear on the search engine result pages (SERPs), and through external sites, like social media networks. To customize your title tags for each page, click on the gear symbol and put whatever you'd like into the Page Title box. Under 55 Characters for 95% visibility. For additional best practices and a pretty cool emulator tool, visit this guide from Moz. Meta description tags are like page advertisements on the SERPs. They have no impact on rankings, but they entice readers to click on your page if it's one of the first ten to show up for a certain phrase or keyword. On the right of each page, click on the gear to change how the description reads. Something catchy with the use of a few keywords. Do you have a lot of photos on your website? Utilize those babies by applying an alt tag on each. They help identify the content of an image for bots (since they can only read text), assist screen reader users, and provide primo keyword application opportunities that improve your SEO as well. Since there are a multitude of ways that you can add images to your site, I suggest visiting Squarespace's alt tag guide before optimizing your images. I use many image blocks for Sarasure, so I find myself either adding (and hiding) the name in the caption or simply changing the file name. Both are easily converted into alt tags thanks to Squarespace. Describe the image in detail with a clever use of your keywords. Just don't go overboard, because that's considered "keyword stuffing." If you need more examples, here's what Google has to say. Establish page hierarchy by applying various header formats to your content. They help divide information up into bite-sized pieces for simple page skimming which becomes great for SEO. Also known as <h1>, <h2>, <h3>, etc. tags, Squarespace automatically formats these within the code so you don't have to. This is another way to add in a couple of searchable keywords. Whilst blogging, use tags and categories to help search engines identify what your post is about. It'll also make your life easier if you should choose to have a blog archive later on. Helpful Resource: Check out Squarespace's help guide for more in-depth tips on how you can increase your SEO visibility. First, create a Google account that will be associated with your site (if you haven't already). Log into to your account and submit your URL to Google. Create a Google Analytics account and fill out the form to obtain your tracking ID. A tool connected to your Google account that allows you to view and measure your website traffic. Best part is that it's free! Using your tracking ID, sync your Google Analytics account to your Squarespace website. Next, add your website to Google Search Console. Previously known as Google Webmaster Tools, this is another free, online service that allows you to check the index and search status of your website. Log back into your Squarespace account and verify your website using the code Google provides you. Follow each step using the links from this message. If you're a one-woman band, like myself, you can skip step number four. First, I clicked the red "Add Property" button and typed in www.sarasure.com. 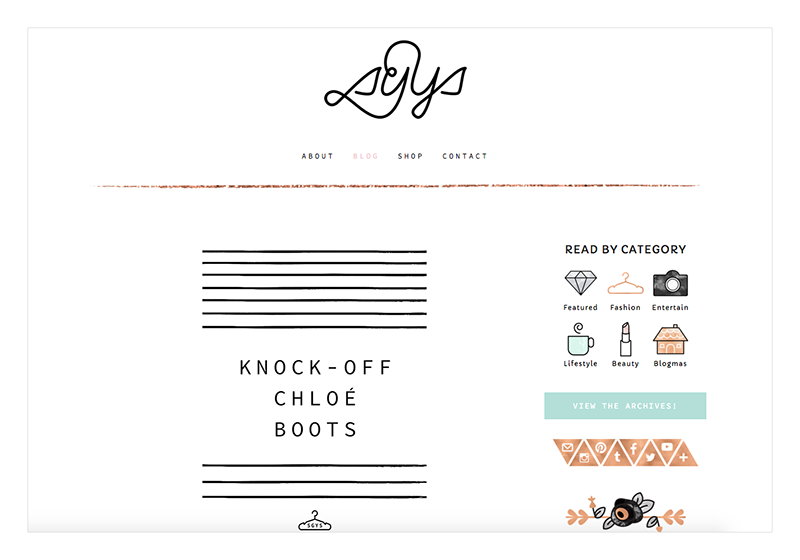 Then I verified my site through Squarespace using the HTML tag option. Tip: Squarespace has an awesome step-by-step guide on this through their help menu. Once that was approved, I simply repeated the first two steps to add sarasure.com. On the Google Search Console, I referred back to my message, clicked on the "set preferred version" link, and selected sarasure.com. Keep in mind that this step is based on personal preference and shouldn't negatively effect your SEO in any way. Your mission (should you choose to accept it) is to keep everything consistent and organized for Google when their bots crawl and index your site. This step is relatively simple to follow once you click on the link provided in the message. Since Sarasure is a company located in America, I selected the United States through the dropdown options. Easy, peasy. To submit your sitemap, go to the Google Search Console and click on your preferred website. On the left-hand side click Crawl, then Sitemaps. Next, click on the red "Add/Test Sitemap" button. Type your sitemap url into the box provided, click "Submit Sitemap," and wait a few days for Google to process your file. A file that lists your web pages, records and measures meta data, and essentially tells search engine crawlers how to intelligently decipher your site content by the way it's organized. Thankfully, Squarespace makes it super easy to remember your sitemap name. If you have a custom domain, it's simply http://www.yourdomain.com/sitemap.xml or http://sitename.squarespace.com/sitemap.xml if you don't. For more information about your sitemap, head on over to Squarespace's help page. If you'd like to learn more about the Google Search Console, the last link in your message will take you to a help center. I personally enjoyed learning about this through this Beginner's Guide via Moz Blog. *Disclaimer: Although I have had SEO experience in the past, I do not pretend to be an expert on this topic and do not offer extensive SEO services to my clients. However, due to the ever-changing nature of Google's Algorithms and abundance of SEO marketing scams, I strongly urge you to reconsider ranking obsession. If you find that you're not ranking for a certain term or keyword, there could be a large variety of reasons why and I have found that the lack of quality content is the single most important factor. My advice is simple: write about what you know and try to make it as helpful as possible. Steer clear from language that people will not understand, write original content, and don't repeatedly try to sell yourself to your audience. Nobody likes that. Why do we need to optimize for Bing I hear you wonder? According to CNN Money, 1 in 5 people still use Bing, so I try not exclude anyone based on their search engine preferences. Begin by submitting your URL to Bing. Then, create a Bing account that'll be associated with your site. Sign into Bing Webmaster Tools and submit your site and sitemap by clicking the "Add a Site" link to the left. For Sarasure, I just added the non-www url because Bing only requires your primary domain. Once your website URL and sitemap have been added, you'll need to verify your website through Squarespace. In the Squarespace Main Menu, go to Settings, Business Information and then fill out your name, location, hours of operation, email, phone number, etc. Google your business name (or name of your site) and update whatever pops up with the exact same information, grammar not excluded. Update your social media accounts with the same proper information (this includes your Google My Business page). Don't have a Google My Business? Make a page to improve your local search visibility. (Online only businesses should create a brand page.) Since Google is the king of all the search engines, I like to participate in all of their endeavors, like Google+, for example. Remember: Once you have something to update, make sure you update everything else. If you get in the practice of doing this, you'll be off to a great start. Just like that, you've optimized your website and are ready to take the world by storm! Do you have any other Squarespace SEO tips to share? I'd love to hear how others are navigating the mysterious and ever complicated waters of website optimization. Shortly after I had launched Sarasure and began blogging, I couldn't believe how fun and fulfilling it became for me. This newfound passion and drive led to multiple conversations with my family and somewhere along the way, two of my siblings joined in on the fun. For example, my brother, Joe, is a musician/visual artist/video blogger (vlogger) and has a YouTube channel called Minimize to Satisfy whereas my sister, Steph, is the creator and blogger behind a fun, personal fashion and lifestyle blog called SGYS. What can I say? I clearly come from a very creative and expressive family. I'm particularly excited for today's design project launch because it involves the brand development and web design for my sister's blog. So let's recount this personal collaboration by taking a look at how SGYS was made. Clean, bold, feminine, modern, friendly, and fun were a few adjectives Steph used to describe her vision for SGYS. Drawn to a messy watercolor texture and a pastel color scheme, she also admired bold lines and the sharp contrast of black and white with a hint of bright, metallic copper. I started off the project by asking Steph to create a separate, secret board on Pinterest and fill it up with photos that suited the visual inspiration she desired for her brand. Here's a look at what I did with some of them. When I reviewed her board, it was eerily similar to how I had mine for Sarasure. The thin, organic meets geometric line art was a definite reoccurring theme while the soft, feminine look of calligraphy represented itself as well. Next, I took to sketching out a few ideas using the SGYS inspiration board as my guide. My mission was to create something clean and orderly with a splash of friendly chaos. SGYS had three logo concepts to choose from. Stephanie had originally expressed interest in using the shape of a wire hanger for a logo concept. It wasn't until after I incorporated this with the SGYS lettering that we both agreed it wasn't the strongest option and decided that we would use a similar shape for the submark instead. Concept one became the best choice because it was easier to read, was simple yet bold, and it meshed well with each branding adjective. The form of this logo is both feminine and modern and exhibits a great deal of fun, playful energy. From there, I made a brand style guide laying out all that was made to bring the SGYS brand to life. This included various illustrations and icons that paired Steph's beloved watercolor texture with sharp, black line art. Once all of the artwork had been designed and approved, I began working on the SGYS website by applying graphics, color schemes, and photography to the Squarespace template of Steph's choice. A few coding tweaks here and there led to this clean, modern, and user-friendly website. The fun continued with custom social media cover art for each social media account in promotion for the SGYS website launch. As of November 7th, the SGYS blog is up and running! Check it out and let us know what you think! Are you in dire need of a personal brand that fits for your blog? If so, contact Sarasure for a free consultation! I recently had the pleasure of working with a very talented local photographer named Jessica Patton. Last summer, Jess did an engagement session with Zach and myself and we absolutely adored her and her style. So when she contacted me to rename and rebrand her business, I jumped at the chance to work with her again. I truly believe that the people who walk into your life are there for a reason. Jess is the type of person that makes you feel comfortable and relaxed when you hate taking photos (like me) to capture moments that feel authentic. She spends time getting to know her clients and once you meet her, you’ll see that she’s as genuine as her work. Her subject matter is very much influenced by raw emotion and her love for the outdoors. Based in Northwest Ohio, she’s more than happy to travel for her clients and the right location. Now that I’ve given you some background on Jess, here’s a walk through our branding adventure together. We began the project by focusing on a brand new name. Jess wanted a name that conveyed emotion, was inspired by nature, told a story, and had a vintage ring to it. Most importantly, she wanted something that reflected her new vision and would suit her ideal audience. Shortly after I assessed her answers to the questions I had given her at the start of the project, I began researching names. (I had so much fun with this process that I created a post about it here.) A few tweaks and eliminations here and there led to Viridian Ivy Images. The word viridian means blue-green. From the beginning Jess expressed her love for blue mason jars, earthly accents, and almost everything nautical. This color alone brought out a description for all three of these interests and felt poetic. Whereas the word ivy symbolized memory, faithfulness, friendship, and marriage. Together, they fit what we were trying to express quite well. 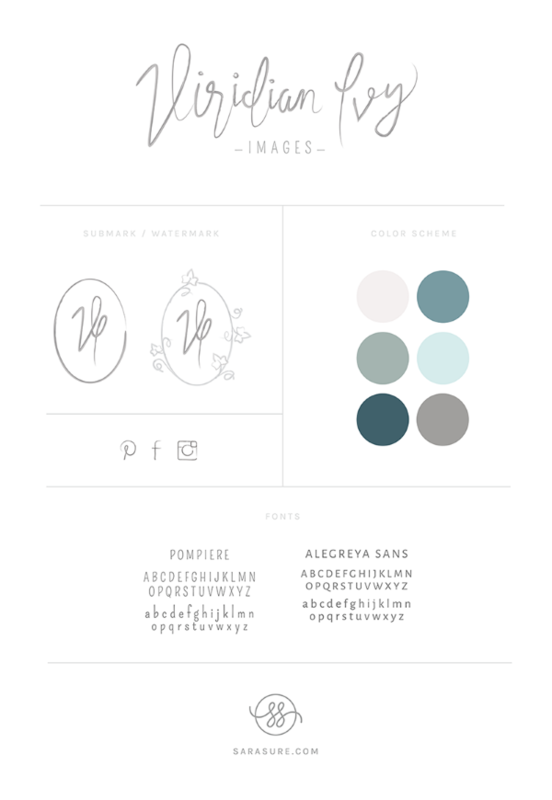 In addition to giving Jess a project worksheet filled with questions about her new name, brand, and website, I asked her to create a Pinterest board that illustrated her vision for her new brand. Earthy, natural, authentic, emotional, and airy were a few adjectives she had given me as an answer to describe how she wanted others to see her brand. From there, I took all that I was given to create an inspiration board that suited the tone, color scheme, and design aesthetic we were after. Then I began creating logo concepts that reflected Jess’s new name, inspiration board, and design goals. It was clear that she loved calligraphy and script font, so I started with a few basic sketches, and then took to hand lettering. We ended up with four different concepts to choose from. After much consideration, Jess and I agreed on the first concept. This hand lettered logo had movement that was light and airy while the softer texture and color gave off a natural, earthy feel. Using the Squarespace account I had asked Jess to sign-up with, I added in the content and photography that she supplied to me. Next, I began implementing her branding elements into the design. Since Jess and I share a deep appreciation for texture, I added in a lace texture to the hover animation over the buttons. For those of you who enjoy texture just as much, you might like my post on effectively applying this to your website design here. To spice up Jess’s about page, I also created six interest icons that illustrated her content. As of August, 26th the website for Viridian Ivy Images has officially launched! Check it out for yourself here and let me know what you think! Are you in need of a new brand and website? If so, feel free to browse my services, view my process, and contact me for a free consultation. This blog is a guide for creative entrepreneurs / solopreneurs and designers alike. It also serves as a place for my most recent design projects, daily inspiration, and updates for Sarasure. Sign up to receive the latest news, events, and special offers from Sarasure!